Checkout Date & Times: Payment must be made with in 48Hrs. of sale closing. Loading times . All items must be removed within 3 days. If you cannot pick up before then please call to make an appointment to pick up. $25 per day fee after then. All property is sold AS Is, Where Is and ALL SALES ARE FINAL. Property is open to thorough public inspection. It is the Bidder's responsibility to determine condition, age, genuineness, value or any other determinative factor. Machinery Auctioneers of Texas may attempt to describe the merchandise in advertising, on the Internet and at the auction but makes no representations. In no event shall Machinery Auctioneers of Texas be held responsible for having made or implied any warranty of merchantability or fitness for a particular purpose. Bidder shall be the sole judge of value. Bidders who bid from off site and are not present at the live auction or preview understand and acknowledge that they may not be able to inspect an item as well as if they examined it in person. It is the Bidder's responsibility to determine condition, age, genuineness, value or any other determinative factor. Machinery Auctioneers of Texas shall endeavor to describe in detail each item and any pertinent information about it. Machinery Auctioneers of Texas will not be responsible for any errors or omissions in the description of the merchandise unless it is a material and intentional misrepresentation of the item itself. Bidder agrees that everything is sold as is and that they may not return any item they purchase. 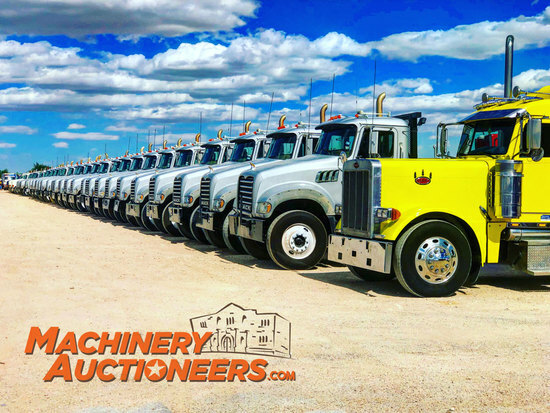 Machinery Auctioneers of Texas is providing Internet pre-auction and live bidding as a service to Bidder. Bidder acknowledges and understands that this service may or may not function correctly the day of the auction. Under no circumstances shall Bidder have any kind of claim against Machinery Auctioneers of Texas or anyone else if the Internet service fails to work correctly before or during the live auction. Machinery Auctioneers of Texas will not be responsible for any missed bids from any source. Internet bidders who desire to make certain their bid is acknowledged should use the proxy-bidding feature and leave their maximum bid 24 hours before the auction begins. Machinery Auctioneers of Texas reserves the right to withdraw or re-catalog items in this auction.